Labs, retrievers, spaniels, setters and Newfoundlands are all famously good swimmers. Some dogs — in particular, dogs with short faces and a top-heavy body — should not or cannot swim at all. If you’re the proud owner of a bulldog, dachshund or boxer, it’s best to keep your dog out of your pool. Small dogs, such as the Chihuahua, are also poor candidates for swimming. If your dog can swim but seems afraid, take special precautions. Using doggie life preservers and introducing your pup to the water slowly are your best bets. Never leave a dog in the pool alone, or assume your dog knows how to get out of the pool. 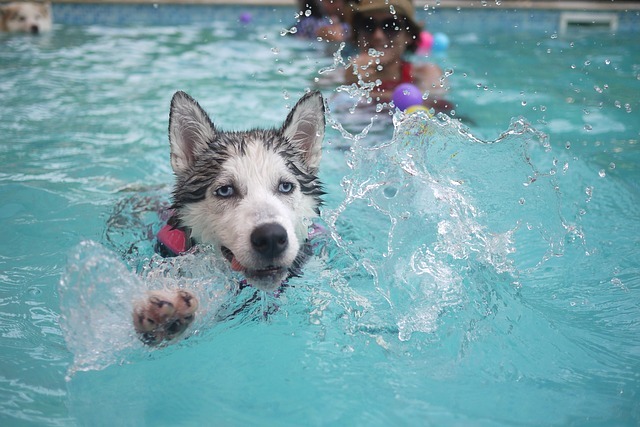 The good news is that happy canine swimmers make excellent company in your pool! Taking a dip helps a hot dog cool off on an uncomfortably steamy day — just don’t forget to provide drinking water, as ingesting pool water could make your dog sick. Older dogs who suffer from mobility issues or arthritis, or dogs who are recovering from an injury may find swimming an important part of the healing process. There has been a steady increase in dog therapy swimming treatments and pools over the past few years addressing just these issues, in addition to recreational dog pools! If your dog is an experienced swimmer, try tossing a tennis ball into your pool — fetch is a fun water game for dogs. If it’s your first time out, go slowly, bring treats and stay patient. Just like housebreaking and teaching commands like sit and lie down, training your dog to swim takes patience. Never throw a new swimmer into the pool — if you do, you may never see your dog near the water again. Instead, sit by the edge of the pool and invite your dog to join you. Encourage your dog, using treats, to dip a paw in the water. Reward him as his confidence increases. If you get in the pool, your dog may be more likely to join you. Worried about keeping your dog out of the pool once he decides he loves to swim? With a glass pool enclosure, protecting your dog’s safety is easy. CCSI International builds custom retractable roof glass pool enclosures for homes and commercial facilities. We understand the unique needs of pets especially as it relates to your pool enclosure setup. If you’re interested in learning more about how adding a pool enclosure will increase your whole family’s enjoyment of a pool all year long, contact us today.